Please would you ensure that where possible; the AutoCAD compatible *.dwg ‘Existing and Proposed Site Layout Plans’ to be provided, follow the bulleted list as below. Thank you for your assistance. To download an example *.dwg copy (2 MB file size) of the ‘UFG Drawing Guidelines’, in the requested format: Please click here. [Download only available using a Chrome Web Bowser: download Chrome here]. Please click here for a PDF copy of the UFG Drawing Guidelines. UFG uses tree surveying software that uses a Global Positioning System [GPS] system to collect the tree survey data during the site visit. This requires that the *.dwg site plan includes the Ordnance Survey [O/S] 6-digit national grid Northings and Eastings co-ordinates, is less than 1-Kilometer in width, without alteration to the grid scale, free of any unnecessary objects and details, so that a simple uncluttered *.dwgsite plan is provided. The 'existing site and / or proposed site layout plan' (including any other required drawings e.g. elevations / cross sections etc) is required at the same scale and orientation’ centred in model space and correctly scaled within a paper-space border, clearly stating the drawing scale, paper size, dates of any revisions and revision notes. Clearly illustrate the numbers of tree/s present within and influencing the site boundary, including a north direction, papersize, a key and a fixed measurement in metres. Provide brief clear details of the proposed development, alterations to ground levels, built up ground, subterranean structures, layout of car parking and driveways. All elements should be unblocked, with all redundant xref references, html links, remnants and /or fragments of previous drawings are removed and that UFG does not need to use the explode function. Ensure that all the drawing elements (E.g. drawing lines, site layout, building outlines, roadways, services, street furniture etc) are all located on their correct layers and that areas of hatching, are not connected to other layers. The *.dwg site plan is to be provided as being drawn in black. Please do not use unclear colours e.g. yellow outlines and yellow text. If *.dwg files are received incorporating multiple colours, UFG may be required to convert coloured lines to black, to clearly assess the drawing provided and re-present it `clearly as required. Any Client proposed landscaping must be on its own layer, that can be switched on and off. Any paper, hand drawn, vectorised or PDF site plan/s will require: electronic tracing, tidy up, re-scaling, and where applicable re-draw work. If any other drawing program is being used other than AutoCAD; prior to it being sent to UFG as a *.dwg file; it is the Clients responsibility to ensure that the drawing in question, including any future revisions are accurately converted for use by UFG in to a current version of AutoCAD. All of the above including any re-draw work apply to any revised or new drawings provided to UFG that are to be assessed and / or worked on. UFG emails *.dwg files using the latest version AutoCAD drawing software and cannot guarantee all elements will remain as set out if used on another software program or a previous version of AutoCAD. 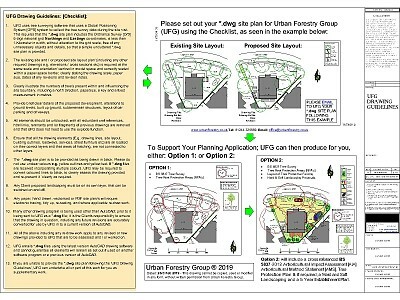 If you are unable to provide the *.dwg site plan following the ‘UFG Drawing Guidelines’, UFG can undertake all or part of this work for you as supplementary work. I have as the Client / Clients agent and as best possible, followed the above drawing guidelines and please find attached the *. dwg site plan as requested. As Urban Forestry Group has not produced the drawings provided, Urban Forestry Group does not know which elements are on which layer. It is impractical to go round and click on every individual element [e.g. building outlines, site layout, hedgerows, street furniture, walls, steps, trees, manholes, services, drainage, gulleys and levels] within the *.dwg drawings provided, to assess which layer each element is assigned too and which may be required to be retained or modified to complete work to the required standard. Following the ‘UFG Drawing Guidelines’ can assist in reducing any unforeseen delays and also remove any possible ‘supplementary costs’ to resolve any site plan drawing issues, whilst undertaking the work. As an Example: Where a ‘previous building layout’ has been drawn and not correctly assigned to its own individual layer, as is the recognised method of using the layers facility on electronic drawing programs. Clicking on elements in the drawing to determine which element is assigned to which layer can be unpredictably time consuming and is unfortunately the only accurate way of checking that the work produced is correct. 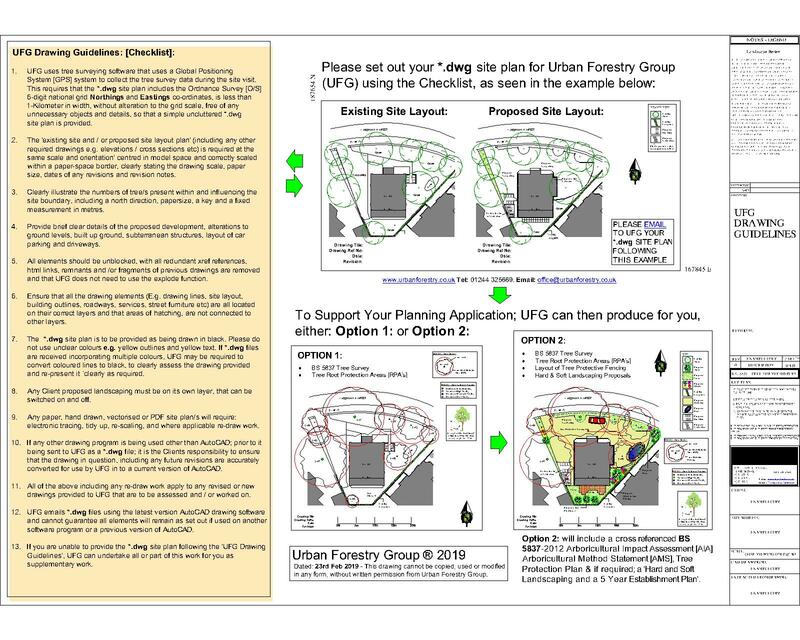 If you are unable to provide the *.dwg site plans following the ‘UFG Drawing Guidelines’ as above; Urban Forestry Group can undertake any of the above work for you and will be happy to discuss this with you if required.